The BBC drama series Peaky Blinders wound up its 4th series just before Christmas. Slowly but surely the programme has steadily grown in popularity. An instant cult classic since the first series aired in 2013, the show maintains a real sense of cool. The series still airs on BBC2 – helping it keep its cult feel – but it’s a show that has now entered the mainstream. 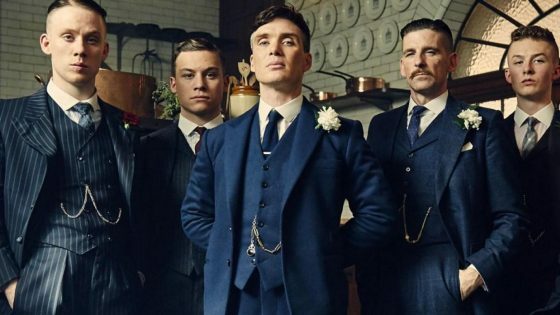 Peaky Blinders retains its cult following. It now also crosses-over and has real mainstream appeal. This is a mark of just how ‘hot and happening’ the show is. In a world where the media constantly tells us what’s hot and what’s not, Peaky Blinders is certainly wonderfully warm right now. Riding on the crest of a wave of popularity, as ever the savviest people around are already exploiting the potential. Just before Christmas a Peaky Blinders themed bar opened its doors in Liverpool. Later this year, the world’s first Peaky Blinders Festival goes ahead at the Black Country Living Museum in Dudley. The event runs over two weekends in September. Revellers will enjoy 1920s and 1930s-inspired cocktails and music. Live street theatre (including staged ‘gang fighting’!) and a chance to drink in the Peaky Blinders’ infamous watering hole, The Garrison. The festival will feature mock-ups on the murky Birmingham backs streets that are so prominent in the series. It hopes to bring the dark underworld of the times to life. “1920s and 1930s-inspired cocktails and music?” Well, that’s interesting. That’s just our bag! Of course, the 1920s have enjoyed something of a resurgence in popularity in recent years. The likes of the hit series Downton Abbey or the Hollywood movie The Great Gatsby have shone a spotlight on the decade. 1920s themed parties or weddings have been become popular. The glitz and glamour is appealing. The fizz and the frivolity – and of course the chance to dress up – has made a Roaring Twenties Themed Event invitation the hottest ticket in town. A Peaky Blinders Themed Party is a great opportunity to pay homage to the great TV series as well as the wonderful decade it is set in. If you throw a party, you need live entertainment. The Jazz Spivs are our signature 1920s jazz act. With a pedigree of performing at Speakeasy and Prohibition-inspired events, a Peaky Blinders themed party and The Jazz Spivs is a combination that really is a marriage made in heaven. If you want the live entertainment for your Peaky Blinders event to be truly authentic and awesome get in touch to discuss your requirements.